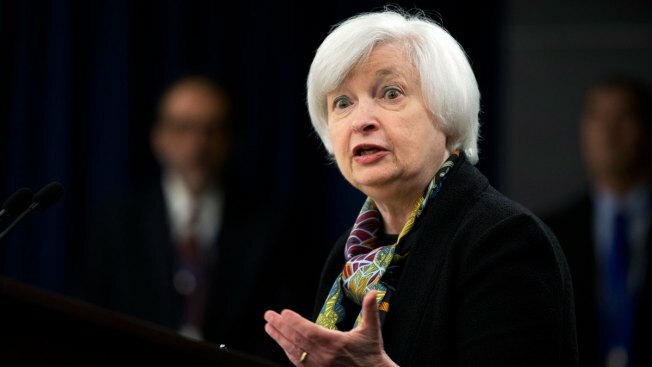 In this March 16, 2016, file photo, Federal Reserve Chair Janet Yellen speaks during a news conference after the Federal Open Market Committee meeting in Washington. On May 18, 2016, the Federal Reserve releases minutes from its April 26-27 meeting, when it kept a key interest rate unchanged amid slowdown in U.S. and global growth. Federal Reserve officials believe that a June interest rate hike is likely at the central bank's next meeting in June if the economy keeps improving. Fed officials decided against raising rates at its April meeting. But minutes of the gathering released Wednesday showed that there was a widely held view that it "likely would be appropriate" to raise rates at the June 14-15 meeting as long as the economy and labor markets continue to strengthen and inflation shows signs of accelerating. The minutes, released after the customary three-week lag, were for the meeting of April 26-27. The Fed voted 9-1 to keep leave interest rates unchanged at that meeting while noting waning threats from the global slowdown. The Fed boosted its key rate by a quarter-point in December and indicated at the time that it expected to move rates up four times in 2016. But financial market turbulence in January, sparked by an unexpectedly sharpl slowdown in China and weakness in the U.S. economy during the first three months of this year, has kept the Fed on the sidelines. It passed up chances to boost rates at its meetings in January, March and April. And in March, it signaled that it was reducing from four to two the number of rate hikes it expects to make this year. While many private economists believed the Fed would remain on hold at the next meeting on June 14-15, recent developments have called that view into question. Inflation, as measured by the consumer price index, rose by 0.4 percent in April, although much of that gain reflected a rebound in energy prices. But other indicators show that the economy seems to be recovering after nearly stalling out in the first quarter, when growth slowed to an annual rate of just 0.5 percent. Robert Kaplan, president of the Fed's Dallas regional bank, said on Tuesday that "in the not-too-distant future" the Fed should be raising rates. Speaking in Midland, Texas, Kaplan said he may advocate for a move in June or July.